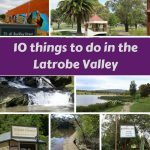 While in the Latrobe Valley, venture out to Yinnar a little town with a lot going on. Even so, it’s quiet and there is lots of parking. 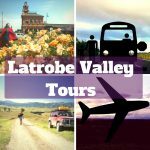 Yinnar is serviced by the Latrobe Valley Bus lines and most things can be seen from the Main Street. Outdoor murals depicting the historic rail line that passed through from Morwell to Mirboo North. The Strzelecki Ranges to the west, the Jeeralang Ranges to the east, farmland in between. These mountain ranges proved great backdrops to landscape photographers. Walking trails there is a walking from one end of town to the other end. It’s a fairly easy walk, paved to gravel path. projects and planting new things. This Skate Park is also in the Main Street, built in 2013, is concrete, surrounded by tall gum trees, a great place to perfect your skating tricks. Shop at the Yinnar General Store, it’s not just the milk and bread in there you will find a host of things that are beautiful, smell great or are cuddly. Four minutes from Yinnar is the Hazelwood Pondage a favourite with speed boat enthusiasts, those who fish, and photographers especially in the cool mornings when steam tendrils curl into the cool morning light. 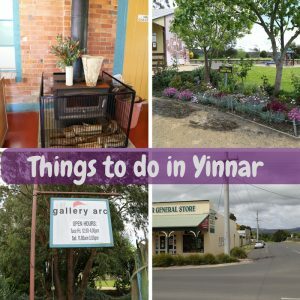 Yinnar has five parks all around Yinnar, two of them are on the Main Street. 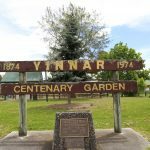 The CWA park on Main Street is has seating and is now the home the Yinnar Skate park, the playground equipment was moved to other parks. Charles Bond Park, Located on Wicks Street, Yinnar – with playground and space to play cricket. Martin Walker Reserve a beautiful reserve out of the township at Upper Middle Creek Road and Gilberts Road in Yinnar South. 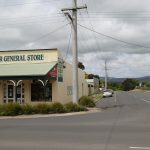 Yinnar Recreation Reserve on Jumbuk Road, Yinnar, the home to local sporting clubs, established in 1958. Holy Innocents Church Yinnar South – the smallest Church 4 by 5 meters, built in 1984. Hosting the Catholic Church and Combined Churches of Yinnar. An artist run art gallery is open to visitors for a donation, it’s called Arc and located in an old butter factory. 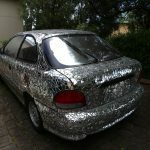 It’s fascinating to see how they’ve claimed art space whilst maintaining a workshop to work in work. The artistic community is very active and all styles of art are on display. 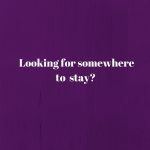 Visitors can purchase some of artworks they fall in love with that are for sale. 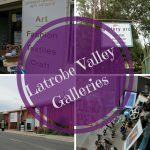 We also recommend seeing the other art Galleries in the Latrobe Valley. 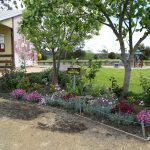 Hazelwood Camping and Caravaning four minutes out of town on the shores of the artificial lake set at a constant 25 degrees all year around until March 2017. 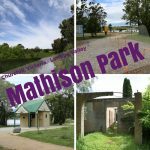 Free camping is available at Martin Walker Reserve a beautiful reserve out of the township at Upper Middle Creek Road and Gilberts Road in Yinnar South. This is ten kilometres out of Yinnar in the bush, with facilities such as toilets. A great spot to stop revive and explore. 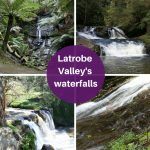 At Morwell River Camping Ground, this is located near the Morwell River Falls tribune thirty-five kilometres out of Yinnar. The Grand Strzelecki Trail, its a great walk taking you to more waterfalls, through the dense Strzelecki bush a well kept local secret. Follow the 94 signs for the Grand Ridge Road – conditions of these road change, in more remote areas they may be utilised as logging tracks. 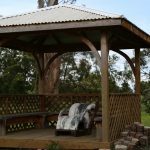 The Strzelecki Highway between Mirboo North and Morwell is a scenic drive that holds treasures at either end. Yinnar Fiddlehead Fesitval (February) A music festival, with lots of market type events. This is a music festival of folk stylings.